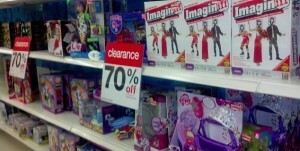 Lots of you just let me know that many Target Stores now have their toys marked 70% off! You might want to rush to your store to see if they have the toys marked down too. Don’t forget to check the prices on the scanner before you head to the register. Let mek now what you find!